When Wigan Athletic took the field at Firhill a week ago there were a couple of faces in the starting lineup that I just could not recognise. One of them was to play in front of the back four, in a style reminiscent of Claude Makelele. He looked a cut above most of the players on the pitch. 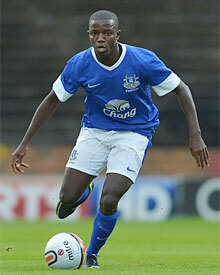 Francisco Junior had only just been signed on loan from Everton, together with Jonjoe Kenny. During the course of that match against Partick Thistle he must have come close to covering every blade of grass on the pitch, such was his work rate. Moreover he was strong in the tackle and remarkably successful in his distribution given that he had never played with his teammates before. Junior constantly made himself available to receive the ball, even when under pressure. He seemed to float past the Thistle midfieders’ challenges. To be honest I had never even heard of Francisco Junior. But how could a player of this quality be so relatively unknown? Checking his credentials on the internet after the game made fascinating reading. Junior had clearly had a chequered past – a player with the quality to play at a high level, but one who has failed to do so up to this point in his career. Francisco Santos da Silva Junior was born in Bissau, capital of the West African nation of Guinea-Bissau, a former Portuguese colony. Junior signed for Benfica of Portugal as a 15 year old in 2007. He went on to play for Portugal’s under 19 and under 21 teams. In 2011 Junior was loaned to U.D.Leiria, a lower division team in Portugal. However, he never showed up to play for them, instead training and playing with Manchester City’s development team, unbeknown to Benfica. The end result was City having to pay €1.5million in compensation to Benfica, where the player returned. Junior signed for Everton in July 2012 on a free transfer, telling the Guinea-Bissau media that was he was “tired of the impasse between Benfica and Manchester City and businessmen who wanted to win more than they should.” He immediately featured in the pre-season and made his debut for Everton in a 1-0 League cup defeat against Leeds United that September. He was to be sent off on loan to Dutch side Vitesse Arnhem in September 2013, where he went on to make just two appearances as a substitute before moving on to Stromsgodset in March 2014. He went on to 9 starts and 2 appearances as a substitute, scoring one goal for the Norwegian club. Junior returned to Everton in August 2014, being sent on loan to Port Vale In March 2015. However, he was to make just one start after receiving a hamstring injury on his debut. Junior has clearly had adjustment problems living overseas and adopting the kind of lifestyle one would expect of a professional footballer at a Premier League club. He is in the final year of his contract at Everton. He has not made it at the club and the likelihood is that he will not be offered a new contract. He has signed for Latics on a month’s loan but reports suggest it can be extended. If he can display that same brand of commitment and skill that we saw on the Scotland tour on a regular basis, Junior will be a player that Gary Caldwell will want to keep. He is still only 23 years old and has the talent to become a highly accomplished professional footballer. To be honest, we know very little about Junior as he’s become one of the forgotten men of our U21s setup. He arrived at Everton with a promising pedigree, having come through Benfica’s youth academy and then joined Manchester City, but the furthest he got was a solitary senior appearance under David Moyes in the League Cup three years ago when we lost at Leeds with half the reserves playing. He was hauled off at half time — somewhat harshly in my view, but I know many Blues don’t agree — and hasn’t been seen since. It came to light last week that he has been battling the temptations of the party scene and the bad influence of some people he says he thought were his friends following the loss of his mother in 2012 which has clearly affected both his development and his standing at Everton. He says he is determined to put it right and is determined to “make it for sure”, in his words. Francisco Junior has opened up on social media about how he almost let drink and partying wreck his career and his belief that he is now focused again on trying to make it at the top level. Signed from Manchester City’s reserve set-up as a promising midfield prospect, the former Benfica academy graduate has been with Everton since 2012 but remains a largely forgotten figure, as far away from first-team contention as ever. In that time he has just one senior appearance to his name, a 45-minute showing at Leeds United as one of half a dozen young players thrown into an ill-fated League Cup tie in David Moyes’s final season with the club. He has been farmed out on loan to Port Vale, Vitesse Arnhem and Stromsgodset while opportunities to push for a place in the first team under Roberto Martinez, like the dead rubber against Krasnodar last December and this summer’s pre-season trip to Singapore, have passed him by. As David Prentice uncovers in the Liverpool Echo, the 23-year-old has admitted to plenty of reasons for why on his Instagram account, not least the loss in 2012 of his last guiding force in the form of his mother and the distracting influence of people he mistakenly believed were his friends. “Sometimes is always better later than never,” the Guinea-Bissau-born player wrote in occasionally broken English. “After I lost my mum three years ago I lost my world. I been nearly nine years now living alone with no family and zero support off no-one. Junior has a season remaining on his current contract and has the coming year to get himself back in shape and focused enough to persuade Martinez that he has a future with Everton. If not, the former Portuguese U21 international is hopeful of doing enough to persuade another club to give a chance to finally make it.